Time and time again the issue of the First Nations housing crisis makes it into the media. And every time I see it I ask myself why things aren't done right the first time. The mouldy, boarded up, plastic-covered shacks are literally third-world, yet they are considered housing rather than something to be bulldozed. Liam Massaubi Repeat entrepreneur, investor and Aboriginal business consultant. 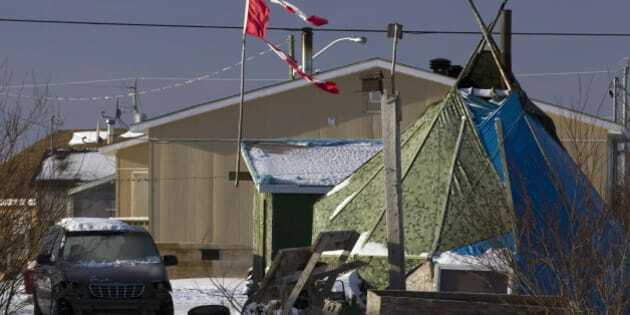 Of course the used trailers that the multi-billion dollar De Beers Company so graciously gave Attawapiskat for housing are "great" and all, but they sure aren't something I'd want to raise my child in. They are a temporary Band-Aid. And that's my point. Governments and big business come in looking good and gain media attention at a time of crisis because they offer something and say they care. But there is absolutely no excuse for any Canadian to be living in these conditions in the first place. The main question that should come to anyone's mind is why doesn't anything sustainable get done for First Nations housing? One of the businesses I am involved with builds custom homes and works closely with home builders. Our homes sell anywhere from $750,000 to around $1.5 million. These homes don't cost that much to put up with skilled labour or take that long to build. Enough with the bulls*** where money gets lost and everyone stalls for 10 years while people literally die and suffer. I don't think any First Nations person is asking for the homes that I build. They are not looking for mansions, they are just asking for a safe place to sleep and live in, and there is absolutely no reason that they shouldn't get that when there is money allocated to do so. One challenge that comes up is logistics. Some supplies need to be flown in or come by boat, and it isn't like there is a Home Hardware on every reservation (although a building supply centre would do well in many First Nations communities). So, pay the shipping costs! Get bulk shipping rates. Make things happen. There are answers for everything and you can ship anything almost anywhere on the planet if you want to. Logistics are not an excuse to let people suffer anywhere in this country. This is probably the biggest. Oversight of the building itself and oversight of the funds. The government could easily step in to guarantee the money after the buildings pass inspection to protect First Nations groups, and we could avoid building the junk that is meant only for a quick show. The federal government is the one who can solve the issue. Stop just cutting cheques, work with the community and start watching over a project from start to finish. This is a simple investment principle: Know what your money is doing. This should be a joint venture where both the First Nations leadership and federal government are involved and all is transparent. Enough with the bulls*** where money gets lost and everyone stalls for 10 years while people literally die and suffer. If houses need to be built, build them. Let's be clear -- builders and contractors can see government funding as easy money and First Nations communities in particular as an easy target to rip off. Let's be clear -- builders and contractors can see government funding as easy money and First Nations communities in particular as an easy target to rip off and do sub-par work for that wouldn't pass in a city. How many years have contractors, consultants and "experts" been going in to First Nations communities? Where is the monitoring and evaluation that shows whether they have provided value for money or had an easy payday with the government picking up the tab? We have to consider the fact that work being done in a First Nations community, away from regulations and monitoring typical in other sites, in and of itself creates a mindset of cutting corners, doing things cheaper to increase profit and providing reports that say what the government wants to hear. Is it cheap to do things properly? No. To completely solve the issue will probably cost a few billion dollars, but the cost of doing nothing is greater and fixing things over and over costs more in the long run when things could be done right the first time. There should be no price put on the safety and well-being of children. To put things into perspective, the federal Liberal government sent $4.3 billion overseas within 100 days of being elected and will spend $1.2 billion on Syrian refugees who will have a better quality of life than the original people of this country. As an advocate for First Nations entrepreneurship, I believe there are solutions. Build capacity within communities to take on construction, maintenance and monitoring. Require outside contractors to mentor, train and pay local community members in every project. Keep money in the community and have people take pride in jobs being done. Provide First Nations builders the tools to do things themselves. If outside companies are producing poor results or charging too much, provide the funding and partnership to those in the community to start a building/construction company. Every politician says they'll solve the crisis, nobody does anything. They either don't want to, or it seems too difficult.